One common myth perpetuated by opponents of raising the minimum wage is that increasing it will mostly benefit young workers who will use the money to support discretionary spending. The reality is much different: Among workers who would be affected by raising the federal minimum wage to $10.10, the average age is 35 years old, and more than a third (34.5 percent) are at least 40 years old. In fact, minimum-wage workers are often bread-winners, with families who depend on their earnings. The average low-wage worker who would benefit from a minimum-wage increase is responsible for half (50 percent) of his or her family’s income (ranging from 33 percent in New Hampshire to 60 percent in Louisiana). 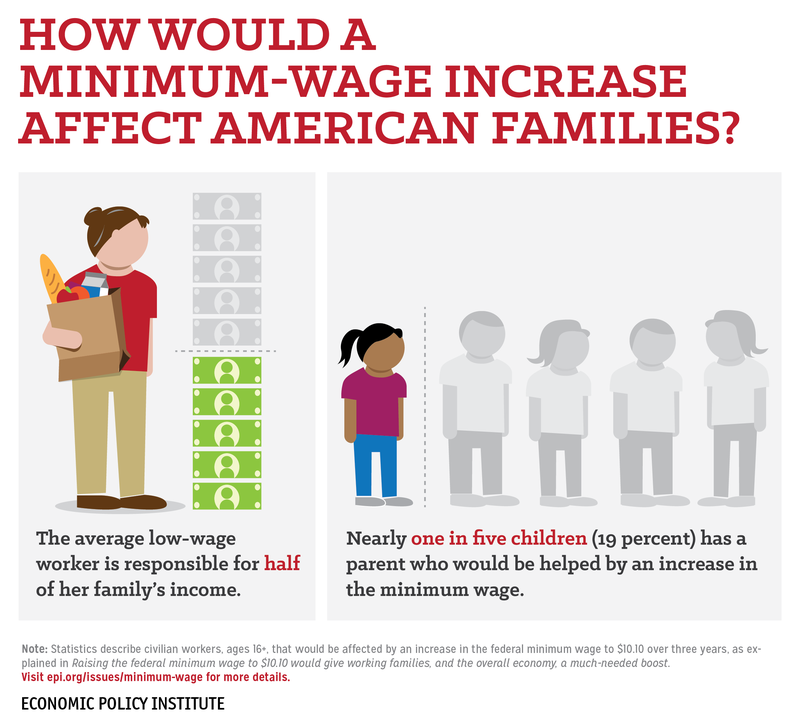 Nationally, nearly one in five children (19 percent) has a parent who would be affected by raising the minimum wage to $10.10 (ranging from 11 percent in Alaska to 26 percent in Texas). While some minimum-wage earners are young workers looking for some spending money, the majority are adults working to put food on their families’ tables. These numbers further reinforce how important raising the minimum wage is to improving the economic well-being of America’s families. Raising the minimum wage increases the number of economy boosting jobs that pay enough for families to maintain spending on the basics, lifting families, communities, and local businesses in the process.